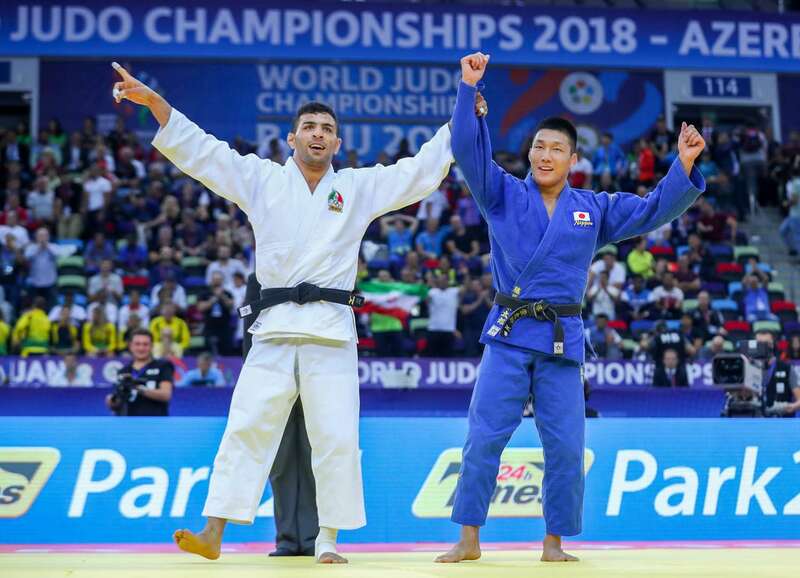 The 2018 World Judo Championships saw France and Iran strike World Championships gold as one of the superstars of judo retained their crown and a world number one realised a lifelong dream to become his country’s second world judo champion in their history. Clarisse AGBEGNENOU (FRA) won her third world title as she retained her 2017 crown by winning all five of her contests by ippon. AGBEGNENOU won her first world title in 2014 and second in 2017 and showed that she is now the best in the world at this weight despite taking silver at the Rio 2016 Olympics. World Judo Masters gold medallist TASHIRO Miku (JPN) was trailing 1:6 in their head-to-head series but battled her French rival all the way in Baku. 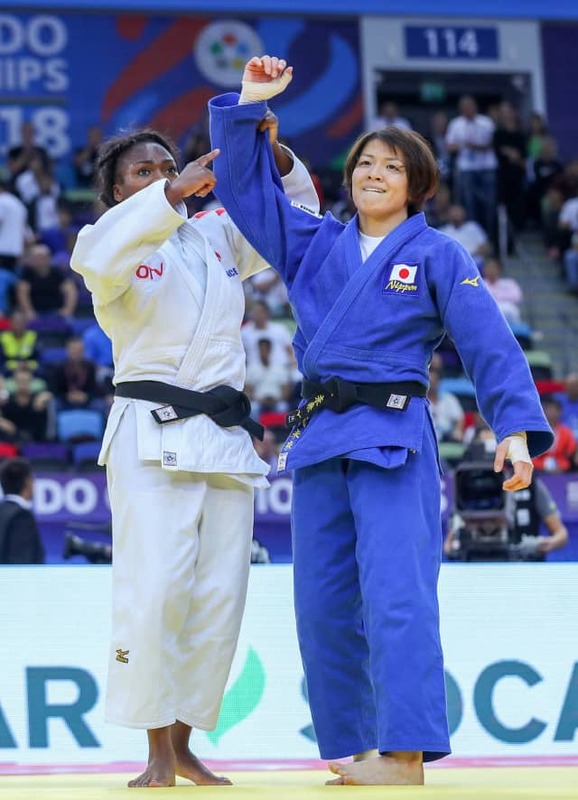 The Japanese had clearly worked on a specific game plan for AGBEGNENOU and it worked until golden score when the powerhouse of the category threw with an emphatic o-soto-makikomi for ippon. AGBEGNENOU screamed with delight and hugged and spoke at length to her Japanese rival in a mutual display of respect and admiration which the photographers and world’s media snapped with glee. In the first semi-final AGBEGNENOU defeated 2015 European Games gold medallist Martyna TRAJDOS (GER). The French judoka sealed her place in the final in just 31 seconds with a menacing performance. AGBEGNENOU threw TRAJDOS with an o-uchi-gari for a waza-ari score and added a second with a o-soto-makikomi without breaking sweat. In the second semi-final TASHIRO defeated Olympic champion Tina TRSTENJAK (SLO). The Japanese marginally outworked her Slovenian rival and produced the only score of the contest from a uchi-mata which earned a waza-ari score. The result meant that TASHIRO advanced to her first world final while TRSTENJAK moved down into the bronze medal contest. In the first bronze medal contest TRSTENJAK held down Pan American Championships winner Maylin DEL TORO CARVAJAL (CUB) for ippon. 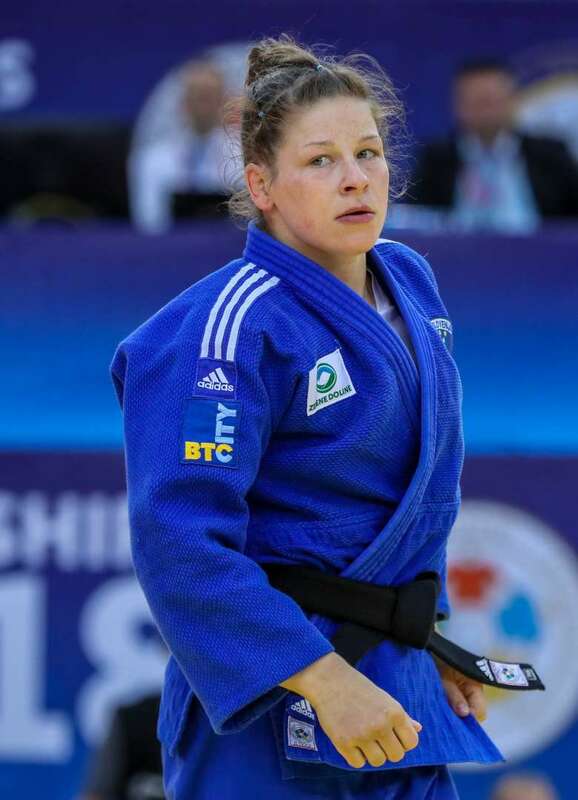 After a scoreless four minutes of regulation time, TRSTENKAK overpowered the Cuban, who appeared to be carrying an injury, with a kuzure-yoko-shiho-gatame for 20 seconds to win her fourth World Championships medal. The result was the reverse of their last content at the Düsseldorf Grand Slam in February when DEL TORO CARVAJAL threw the Slovenian twice. 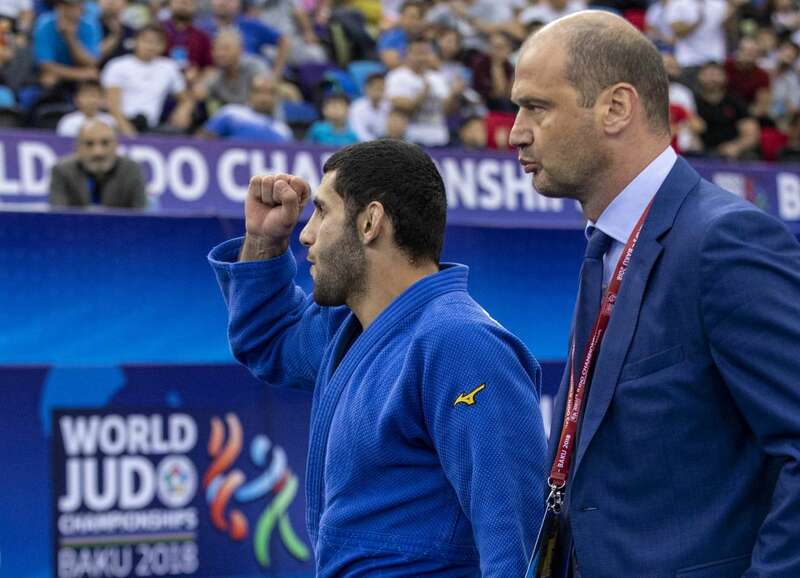 In the second bronze medal contest TRAJDOS, who finished fifth a year ago, suffered the same disappointment all over again in Baku. Ekaterinburg Grand Slam silver medallist Juul FRANSSEN (NED), who herself finished fifth at the Worlds in 2015, won the battle between the two top-tier judoka who were both seeking their first World Championships medal. FRANSSEN countered a weak uchi-mata for a waza-ari score after two minutes of additional time to win bronze and left the mat in tears after a turbulent post-Rio 2016 spell has finally turned into joy for the Dutchwoman who secured the Netherlands’ first medal in Baku. World number one becomes Iran’s first world judo champion since 2003 World number one Saeid MOLLAEI (IRI) was crowned Iran’s first world judo champion in 15 years as he improved on his bronze medal from 2017 with gold in Baku. MOLLAEI defeated two-time Grand Slam winner and World Championships newcomer FUJIWARA Sotaro (JPN) in golden score. 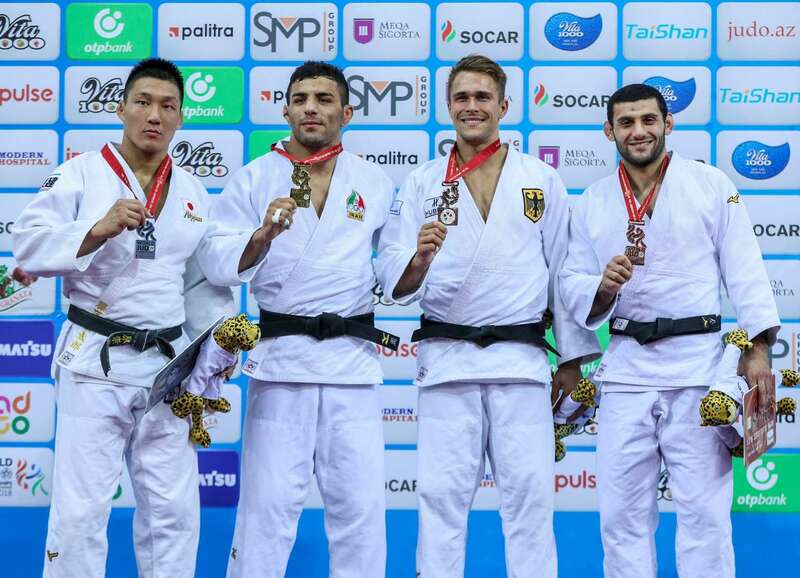 Iran’s last world judo champion was Arash MIRESMAEILI (IRI) and their delegation had already medalled this week after Mohammad MOHAMMADI (IRI) won -73kg bronze on Saturday. 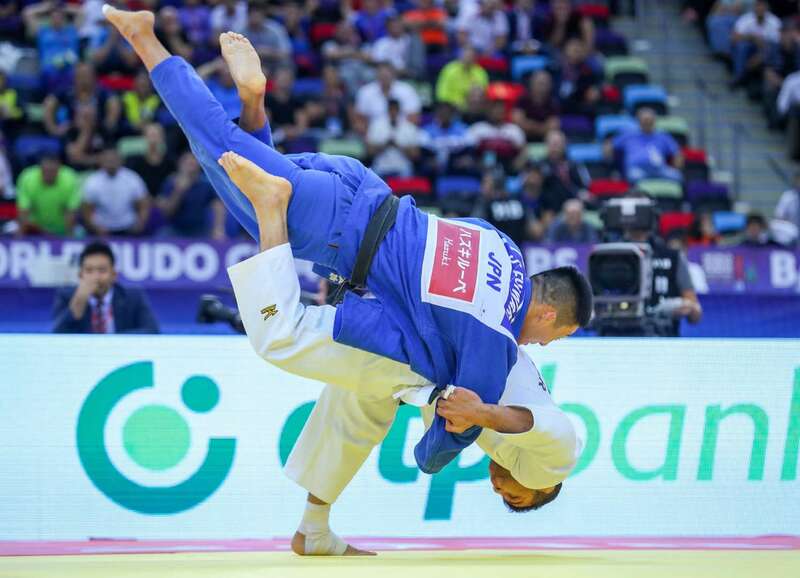 The Iranian went ahead with a waza-ari from a modified kata-guruma after 90 seconds before the Japanese youngster levelled the scores with an o-soto-gari with 55 seconds left on the clock. After 16 seconds of added time, MOLLAEI blocked a ura-nage and threw with o-soto-makikomi for his second waza-ari to take gold. The winner fell to his knees and held his hands aloft before pointing to his fans and his flag in the crowd. In the second semi-final FUJIWARA beat Zagreb Grand Prix winner Dominic RESSEL (GER) in golden score. The Japanese launched after two minutes with a sasae-tsurikomi-ashi to move into the final and guarantee one more medal for his country. In the first bronze medal contest RESSEL lost out to defending world champion Alexander WIECZERZAK (GER). WIECZERZAK lost his red backpatch and title but won the respect of his peers, fans and the media alike by proving himself at the leading event on the IJF World Judo Tour for the second year in a row. RESSEL went behind to a waza-ari score from a seoi-nage with three seconds left on the clock to avoid golden score. WIECZERZAK had his doubters, who believed his 2017 victory was a one-off, but showed he’s here to stay among the best of the division after winning back-to-back Worlds medals. In the second bronze medal contest ALBAYRAK defeated former Samsun Grand Prix gold medallist Damian SZWARNOWIECKI (POL). The Turkish judoka prevailed by ippon to earn Turkey’s first medal at Baku 2018. ALBAYRAK has now won four IJF medals this year and will break into the world’s top 10 having delighted the many travelling Turkish fans.